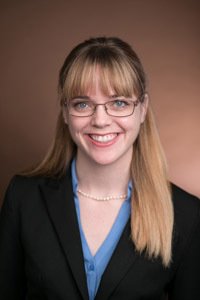 Alice Blumm is an Associate Attorney at Shea Aiello, PLLC. Alice’s higher education began at Seton Hall University, where she graduated with a Bachelor of Science in Diplomacy and International Relations, and minors in French and Asian Studies. While attending Seton Hall, she was an active member of the College Democrats. Alice then studied at Wayne State University Law School, where she received her Juris Doctor. Alice also received her certificate as a Trained Mediator in Wayne County. During law school, Alice interned at a law firm in Beijing, China where she researched and presented American legal topics to the firm’s associate attorneys. Alice also interned with the Perkins Law Group, PLLC. With PLG, Alice conducted legal research and writing in topics such as municipal law, police misconduct, and the Freedom of Information Act. In law school, Alice developed an interest in estate planning, tax law, and bankruptcy law. Currently, Alice specializes in Estate Planning. This includes preparing Wills, Trusts, and Powers of Attorney for her clients so they can feel confident that their family will be taken care of and their wishes will be followed should anything happen to them. Outside of work, Alice enjoys traveling, gardening, and spending time with her family. She and her husband, Nick, married in July 2016.